The security-related legislation submitted by the government of Prime Minister Shinzo Abe has become very controversial, both in Japan and elsewhere. People are wondering why such bills were introduced, whether Abe intends to turn Japan into a military power and expand the boundaries of self-defense, and why so many people in Japan are against them. The legislation has two main objectives: (1) to secure Japan’s peace and integrity and (2) contribute to international peace and stability. The following gives a brief overview of the bills and their aims. The securing of Japan’s peace and integrity has grown in importance due to the fundamental transformation of the security environment in recent years. This can clearly be seen in the shifting balance of power, particularly in Asia, rapid advances in technological innovation, the proliferation of weapons of mass destruction, and the rise in terrorist attacks and cyber threats. The legislation is aimed at addressing these developments. At the same time they are premised on the thinking that no country can secure its peace by itself alone; in Japan’s case, it has relied on and will continue to maintain its alliance with the United States. In this context, the bills have two focuses. One is for the Self-Defense Forces to provide logistic support for foreign forces in situations that will have an important influence on Japan’s security. Another is to introduce the concept of the right for collective self-defense, which the government had long interpreted as being prohibited by Article 9 of the Constitution. With regard to the latter, in July 2014 the Japanese government decided to change its constitutional interpretation, but the exercise of the right for collective self-defense is allowed in very limited situations, such as an armed attack against a foreign naval vessel (belonging to the US Navy, for example) in waters close to Japan that poses a threat to Japan’s survival. The second component of the legislation—contributing to world peace and stability—is an important pillar of Japan’s foreign policy. The international community has indicated its desire for Japan to shoulder a bigger security burden, and Abe sought to honor such requests by announcing in his policy speech before the Diet that he would promote Japan’s proactive contributions to international peace. Two different activities are envisioned by this. One is related to the expansion or easing of restrictions in the use of arms during UN peacekeeping operations. Another is the provision of logistic support when collectively addressing a situation that threatens international peace and security, based on a UN resolution or other international consensus. 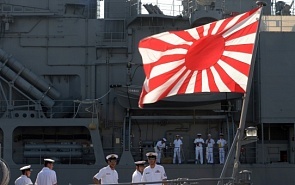 Prime Minister Abe certainly does not intend to make Japan a military power. It is only in response to the transformation of the security environment that he felt the need to make the Japan-US alliance more functional and to promote collaboration with strategic partners. Japan, after all, has not changed its exclusively defense-oriented posture, and there has been no significant increase in the defense budget for 20 years. The expansion of the boundaries of self-defense to include the exercise of collective self-defense is extremely limited, as mentioned above; still, it is much narrower than the right most other countries enjoy. It has, moreover, nothing to do with Russia; in fact, there is every possibility of Japan providing logistic support to Russian forces, for example, during UN peace-keeping operations and within other international peace support frameworks. In order to accomplish the aim of the preceding paragraph, land, sea, and air forces, as well as other war potential, will never be maintained. The right of belligerency of the state will not be recognized. The article was the basis for the controversy surrounding the Self-Defense Forces. The constitutionality of the SDF has been firmly established by assigning it an exclusively defensive role, though, preventing it from being used as “means of settling international disputes.” The SDF’s activities and operations are severely restricted; moreover, its participation in collective defense arrangements that may lead to taking military action in foreign countries had been prohibited. The government’s reinterpretation of Article 9 eases this prohibition for a very limited number of cases. The new legislation has nonetheless triggered a strong backlash among those who criticize it as being unconstitutional. While the bills merely call for procedural changes, critics have begun calling them “war bills” and have incited a public uproar. The government should have explained that the bills have many other important objectives, but the prime minister chose to focus on the right of collective self-defense, even though this right is very narrowly circumscribed. To make matters worse, the legislation is very complex with many gray zones, raising suspicions that it was intended to enable Japan to wage war. Deliberations on the bills that are now starting in the upper house could dispel such suspicions and lead to a more balanced understanding of the legislation. Toward that end, the government should seek the cooperation and support of a number of opposition parties. This would also contribute to a better understanding of Abe’s initiative among foreign countries.